A car park, which was discovered to be unsafe forcing a multi-million pound shopping centre to close last Christmas, could be rebuilt in 2007. It is one year since Bournemouth's Castlepoint closed because of fears the car park's concrete was unsafe. Temporary remedial work means most of the car park is in use and the £200m centre will remain open this Christmas. 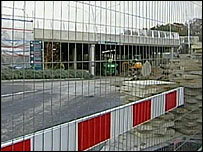 Castlepoint management told the BBC: "We very much hope work can be started on rebuilding the car-park in 2007." The issue over who will pay for the rebuild has not yet been resolved. A Castlepoint management spokesperson said they had been "working extremely hard to resolve the issue and progress is being made". A spokesperson for Bournemouth Borough Council added: "We are continuing to liaise with Castlepoint Partnership and Castlepoint management on various issues concerning the site and look forward to the matter being resolved." Castlepoint shut without warning on 1 December, 2005, following reports from engineers highlighting health and safety concerns. The car park and centre were only able to partially reopen before Christmas and the rest of the shops reopened in stages over the next two months.